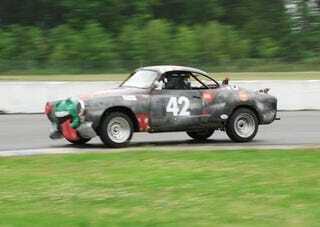 Yes, a Volkswagen Karmann Ghia with a Hitchhiker's Guide theme defied the odds and took the 2010 Cain't Git Bayou 24 Hours of LeMons Index of Effluency trophy. The VW was reasonably quick around the track, only broke down a half-dozen or so times, and finished a strong 12th place. According to the team, "every gauge on the dash was pegged" for most of Sunday, the result of a lunched oil pump and the not-quite-right replacement pump they scavenged off the seized-up "parts engine" they brought along. Oil pressure spent the day spiking to 120 PSI and then dropping to zero, while their door-hinge throttle linkage proved quite troublesome as well. Nevertheless, a top-third finish for an air-cooled VW is simply outstanding. Congratulations, Team Mostly Harmless! Disclosure: Murilee Martin gets crazy baksheesh from 24 Hours of LeMons HQ for his work on the bench of the LeMons Supreme Court.